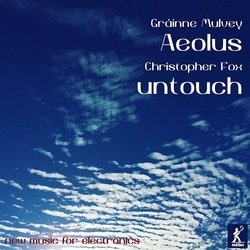 The other work on the disc, Christopher Fox‘s untouch, is the first of a two-part work (untouch—touch) for solo percussion. While the second part involves the soloist striking Thai gongs, untouch reconfigures their actions to the triggering of sine tones. 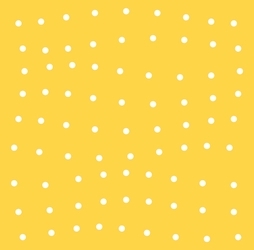 There’s something genuinely uncanny about this abstraction (surely enhanced by seeing it in performance) both in the nature of the tone’s timbre – which doesn’t bear any meaningful similarity to gongs yet knowing about the second part continually brings them to mind – as well as their unfolding over time, begging the question of whether their continuity and the patterns that briefly emerge are arbitrary or closely-controlled. An intriguing, unconventional pair of works. Another relatively short but engrossing disc is The Listened To Sound, by US sound designer John Wiggins. An interesting aspect of its eight tracks is their duration: half of them last less than two minutes, with only one clocking in at more than 10 minutes (and only just). As i noted when reviewing William Price’s Rush Hour, i wish there was more electronic music demonstrating what’s possible in very short durations. In the case of The Listened To Sound, i’d venture that it’s more engaging not to think in terms of individual tracks and what they’re discretely ‘about’ but to hear them as sections in a larger single narrative. 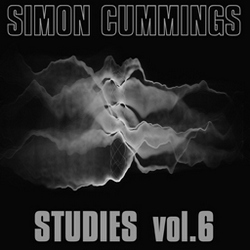 The title is significant, implying – and this is borne out in the music – that Wiggins has listened extremely carefully to his collection of sounds (all field recordings) in order to understand what makes them tick, and to find what makes them gel or repulse. It’s worth noting too that despite these eight short pieces being composed over a three-year period, this is in no way obvious due to their consistency of style and approach. 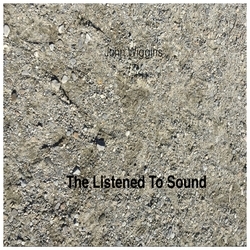 i spoke about sounds both gelling and repulsing, and in some of the pieces, Wiggins throws things together in close proximity with real abandon; from a listening perspective it’s hard not to feel physically pulled into these juxtapositions, being struck on all sides by their sharp edges. Despite how i’ve described that, though, there’s nonetheless a real sense of improvisational consideration being given to these sounds, so whereas Think Outside and Alaska Film 2 present violent, rapid-fire soundscapes, in works such as co·a·lesce and String II this muscularity is channelled into a more overtly obvious control and sensitivity. 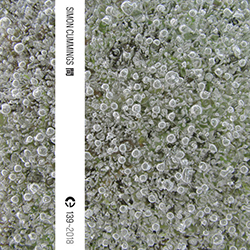 co·a·lesce is, for me, the highlight of the disc, combining sustained pitches within a busy texture of field recordings. Elsewhere, String I opts for a by turns more dense and more granular use of sound, putting less emphasis on details in favour of more generalised activity, later developed into a complex maelstrom of chimes, rumbles and clatter, a whole host of individually discernible elements swirling around. Among the Unimaginable is similarly convoluted, combining big, anonymous, reverberant shapes with glimpses of guitar strings (and even, very briefly, the opening of New Order’s Blue Monday!) before evolving into a bifurcated fast/slow environment culminating in an intense drone that ultimately shatters. For all its brevity, there’s real sonic magic happening on this disc. And speaking of magic, the album that’s got me more excited than anything else lately is Cor Unvers, a new CD on the US Ge-stell label from English composer Lee Fraser. Fraser’s last album, 2014’s Dark Camber, was my album of the year and remains one of the best things i’ve ever heard. That’s a lot to live up to, but Cor Unvers not only manages to do just that, but listening to its four tracks is like hearing electronic music for the first time all over again. One of its great strengths – and this was also true of Dark Camber – is Fraser’s unique dramatic sensibility. From one perspective, it would be easy to characterise his work as streams of consciousness. Certainly, in all his work there’s a robust sense of forward motion, of ideas continually evolving and reshaping themselves both independently and in response to other ideas impinging upon them. There are no repeats or recaps in Fraser’s music: always onward, for the most part never looking back. To an extent this makes Fraser’s music difficult to talk about – difficult, indeed, to get your head around and get a handle on. My first encounter with Cor Unvers was 38 minutes of overwhelmed bedazzlement; it’s taken time and further encounters just to be able to begin to say something coherent about it. Furthermore, many of the things Fraser does with sound are practically indescribable: it’s like watching a fireworks and light display beamed to Earth from an alien planet. But to return to my main point, its Fraser’s dramatic sensibility that makes these discombobulating streams of consciousness coalesce into music that at no point is anything less than completely compelling and, amazingly, convincing. Using CSound to compose his music, literally from the ground up, these four pieces are about as removed as it’s possible to be from the anecdotal and recognisable elements prevalent in most electronic music. They’re exercises in sheer synthesis, in the plasticity of sound, scrutinising it at a molecular level before playfully constructing it into entirely new sonic elements. That makes it sound scientific, but it’s not at all: play is what typifies the behaviour of these pieces, radical acts of creation governed by quirk and caprice and whimsy. Inevitably, now and again a sound – or, more often, an agglomeration or juxtaposition of sounds – will act as a mental trigger, bringing to mind bells, streams, shimmering light, metallic clatter or, on one occasion, rotating bicycle spokes. But these are less deliberate evocations and allusions on Fraser’s part than subjective attempts to parse and decipher and navigate through the music’s inscrutable soundworlds, where ideas are at one moment aligned in intricate grids, the next hurled over each other with muscular force like the splashes across a Pollock canvas, where enervated textures are abruptly injected with vast quantities of energy, where multiple climaxes can take place without diminishing their power or impact, and where just when you thought sound couldn’t be more immediately foregrounded, something happens so impossibly close it’s as if it had jumped right out of the speakers onto your face. This is the apogee of electronic abstract expressionism, the most gloriously awe-inspiring display of sheer creativity, and easily the best thing i’ve heard all year – by far. Just incredible. Cor Unvers is available directly from Fraser’s Bandcamp site, while those on the opposite side of the Atlantic can get hold of it either from Ge-stell or Careful Catalog. But it’s worth noting that this is a pretty limited physical release, so you won’t want to (and absolutely shouldn’t) hang about.